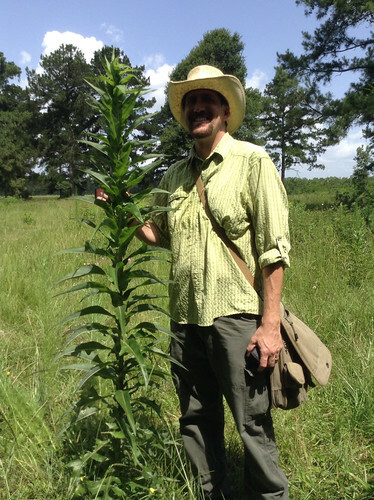 There are twelve different wild Lactuca species, of which I've only found three. These are Lactuca serriola (aka prickly lettuce), Lactuca canadensis, and Lactuca floridana. Lactuca floridana and Lactuca serriola are fairly common in the Houston area while Lactuca canadensis appears more frequently in areas north and east of Houston. Lactuca canadensis. Note the lobed leaves at the base and unlobed leaves up higher. Young Lactuca floridana. All leaves are lobed. Texas distribution, attributed to U. S. Department of Agriculture. The marked counties are guidelines only. Plants may appear in other counties, especially if used in landscaping. 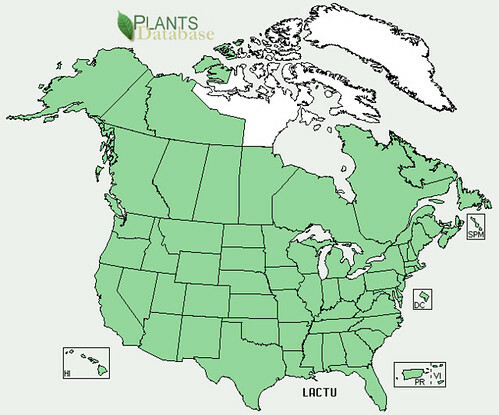 North American distribution, attributed to U. S. Department of Agriculture. 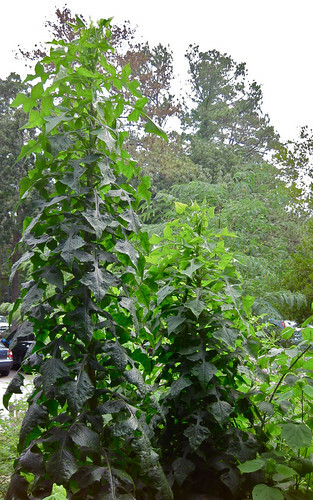 Both the tasty Lactuca canadenesis and the somewhat bitter Lactuca floridana can grow 7-9 feet tall. Leaves: deeply lobed at base of plant but much more un-lobed, grass-like at top of plant. Sap: white at first but quickly turns dark yellowish as it dries. Sap: stays white even after drying. 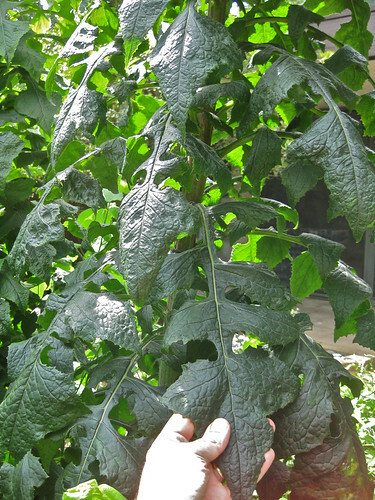 Leaves: deeply lobed from base of plant all the way to those at top. Height: up to 16 feet. 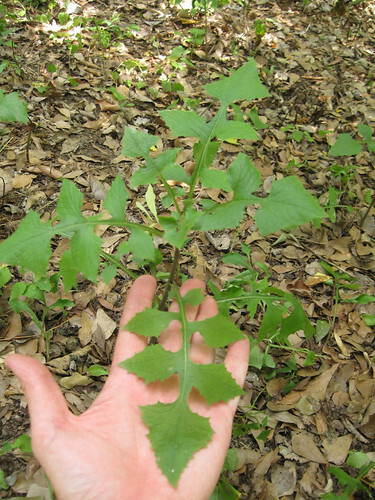 The young leaves of L. canadenesis have a slight bitterness, even less than some arugulas, and can be added to salads raw. 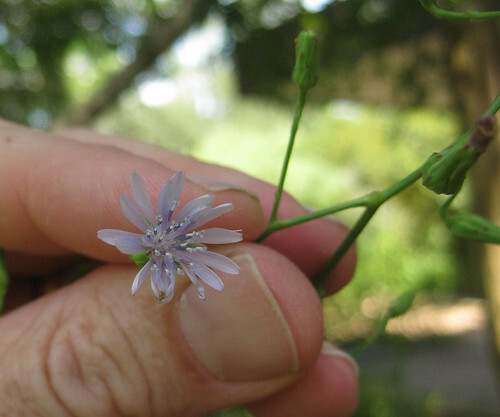 The flower stalks are tender before the flowers open and can be snapped off and cooked similar to asparagus. L. biennis is extremely bitter even when very young. Boiling in multiple changes of water helps but most people still don't like it. On the plus side, the plants produce a LOT of leaves, so you can get a lot of food from it. There is some record of wild lettuces being smoked for medicinal purposes but it is supposedly a very harsh smoke and must be mixed with other herbs to reduce this harshness.